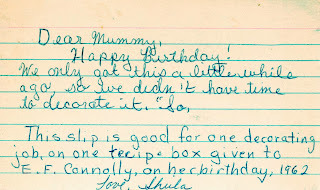 My mother was a good plain cook of the meat/starch/veg school. She became more adventurous only after I’d gone off to college and she started playing a lot of bridge. Those bridge ladies were really into food, so my mother collected quite a few recipes for dips and canapes and the like. 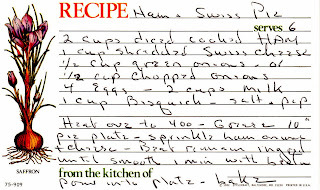 But I have only one stack of index cards that make up her entire recipe collection. 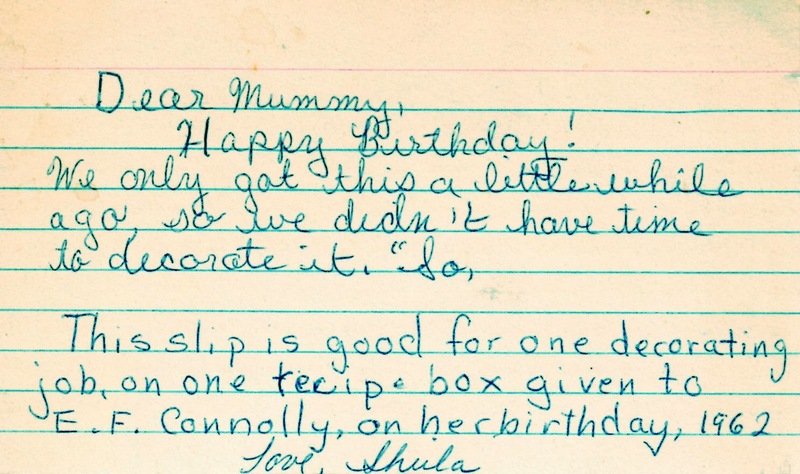 I gave her a box and the first cards in 1962, as you can see, and there are contributions from my grandmother, me, my sister, my grandmother’s occasional housekeeper, and some of those bridge ladies. 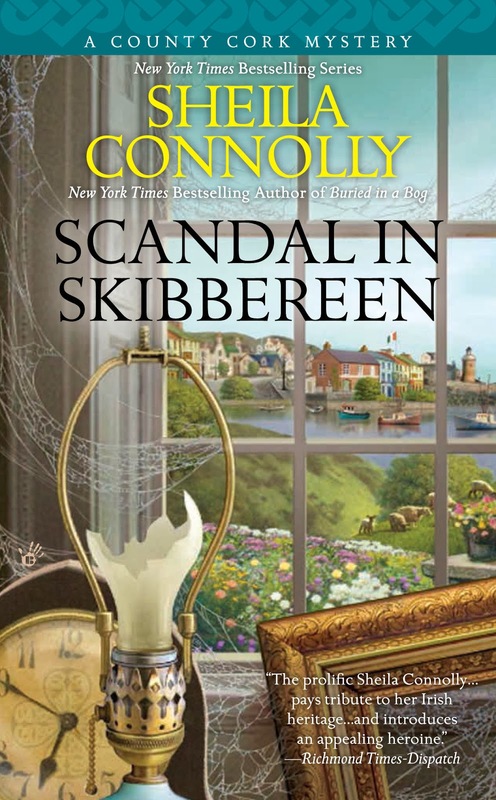 They are much as you would expect from that era—there is a lot of Jello involved. 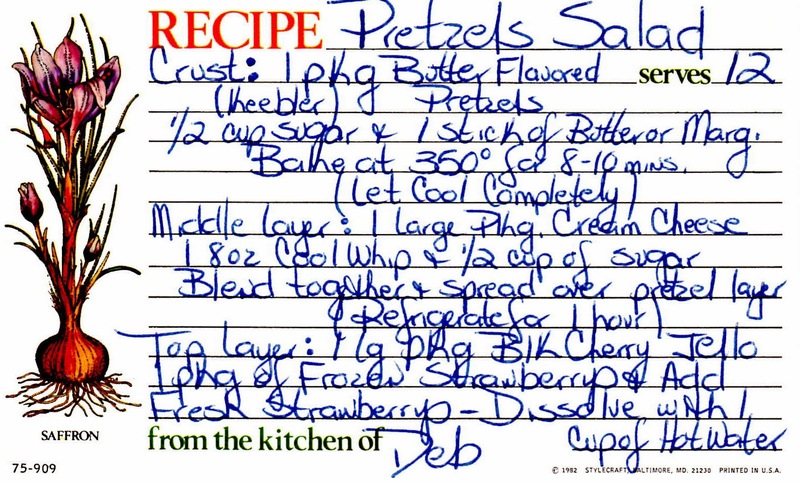 I will not burden you with some of these recipes (like my sister’s Pretzel Salad, which involves a package of pretzels, sugar, butter, cream cheese, Cool Whip, and Black Cherry Jello). But I was giddy enough to purchase an eleven-pound ham for Christmas (for three of us? What was I thinking? ), and there’s plenty left over, some of which will be frozen for later use. 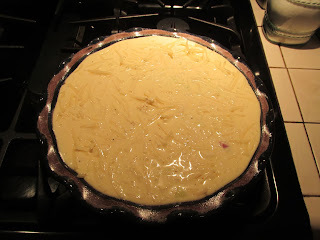 But my mother did have a recipe for Ham and Swiss Pie which sounded more or less edible, and I’ve got plenty of ham. Think of this as an experiment in retro cuisine. Preheat the oven to 400 degrees. Grease a 10” pie plate. 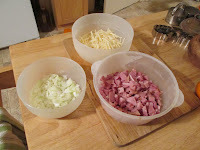 Sprinkle the ham, cheese and chopped onions over the bottom of the plate. Beat together the eggs, milk, Bisquick, salt and pepper for one minute (with a hand mixer or stand mixer) until smooth. 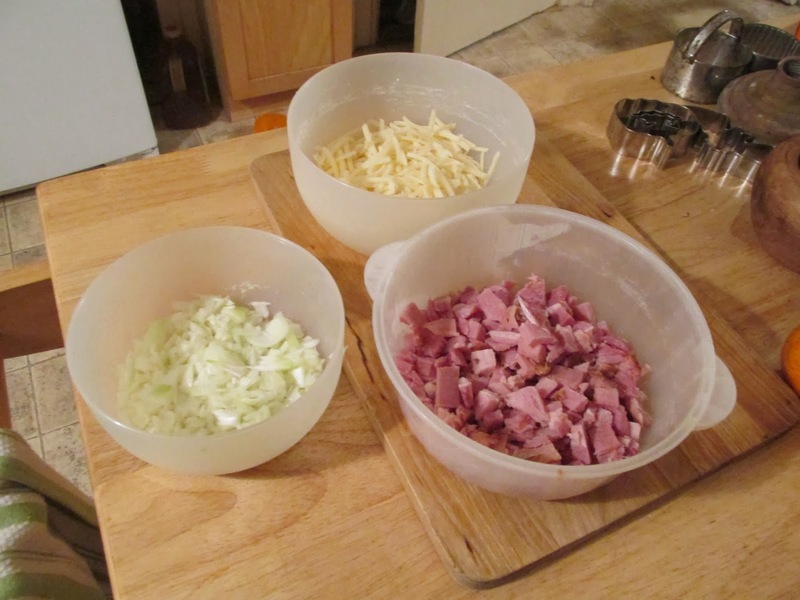 Pour the liquid over the ham and cheese layers. Would you believe this was better than I expected? The ham and cheese kind of floated to the top, which then browned nicely. 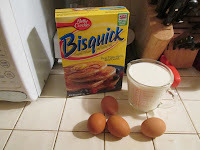 If I was a snob, I could have deconstructed the Bisquick into its components—but this is what it is, straight from the 1960s. And it tasted good! Wow. Think about it--a world before the quiche. amazing, huh? Thanks, Sheila. This convenient, quick recipe comes just in time. 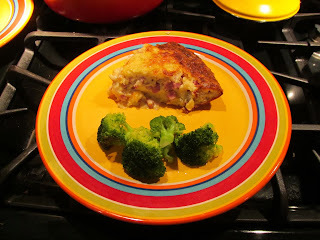 I was looking for something that involves leftover ham, and an excuse to use the oven (and warm up the house). :I love the notes and handwritten recipes. And this recipe proves there's gold in them thar hills. It looks good too! Ah, retro cuisine. My mother used to combine a box of cake mix and one of pudding, and we thought that was pretty gourmet. My mother-in-law used to make a salad that involved peeled grapes (yes, peeled. Have you ever tried peeling a grape? ), nuts and a lot of whipped cream. i think there might have been some celery in there, too. But this sounds really good actually! 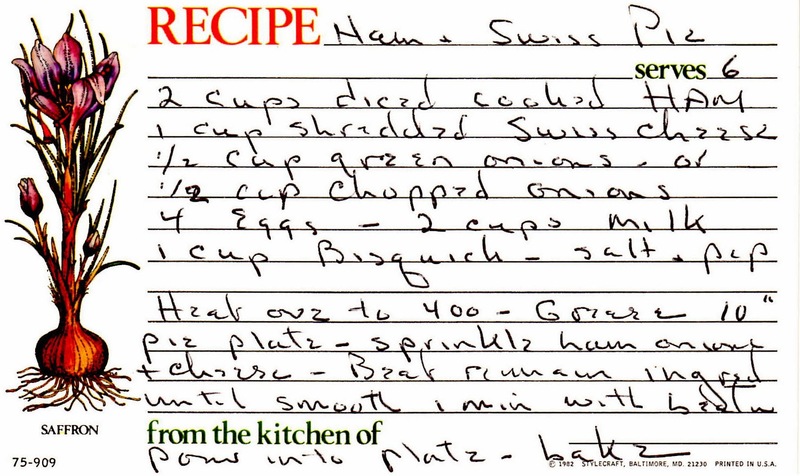 We have a ham in the freezer so when I eventually cook it, I'll have a great recipe for some of the leftovers. I love the note your wrote for your mom! I would have thought a little lawyer-to-be wrote it because it was so specific! Adorable. The pie may not appeal to snobs, but even most of them have comfort foods that they like. I bet it was great. I love quiche! ;) say cheese! PS love the Dear Mommy card!! 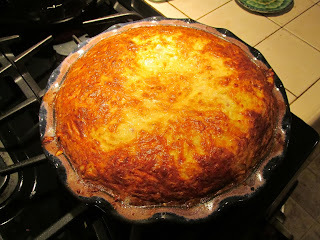 I've been making this for years - recipe right off an old box. We had it last week, too, with our leftover ham. Yum!